If all goes as planned, you'll even forget what day it is. Go easy on the little ones. They'll soon be taller than you. Each rental varies, but all stay true to a beachy motif. Stay close to your nappers while making the most of the views. 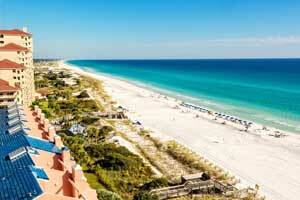 2.4 miles from The Golf Garden of Destin. Sterling Resorts Huntington by the Sea is designed with the emphasis on that last part of the name. This serene, beach-centric getaway promises low-key days filled with nothing but shell-searching and sand castle-making. There’s a beachfront outdoor lap pool, where the kids will chase dive sticks for as long as you’re willing to keep tossing them. When it’s time to start thinking about dinner, call time-out, wrap them in towels and head up to your spacious vacation rental – complete with fully equipped kitchen and roomy living/dining areas. Check out the onsite DVD rentals for easy after-dinner entertainment. Mornings are perfect for your balcony or patio. Sneak outside early, mug of coffee in hand, to enjoy the peace and quiet before the kids start banging cabinets looking for cereal. Thinking about venturing out? Whether you’re more into state parks or water parks, both options are close by. - Front desk is open 9:00 AM-5:00 PM daily. Guests that are planning to arrive after normal front desk hours must contact the property in advance using information on the booking confirmation to receive codes to lock-boxes with keys to the unit. - The individual making the reservation must be 25 years of age or older and must occupy the rental property the entire term of the reservation. Singles under 25 years of age are prohibited unless accompanied by parent or legal guardian. Restrictions may apply regarding the number of people that may accompany a parent or legal guardian. During the spring break vacation period, the age policy will be strictly enforced and identification of all guests will be examined at check-in. If guests are not 25 or older, the full amount of stay will be forfeited; no refunds. Occupancy limits in guestrooms are strictly enforced. Chaperoned groups are prohibited. Please contact the resort for Spring Break Security Deposit information using the information provided in the booking confirmation.